[PDF] Debates in Modern Philosophy: Essential Readings and Contemporary Responses (Key Debates in the History of Philosophy) | Free eBooks Download - EBOOKEE! 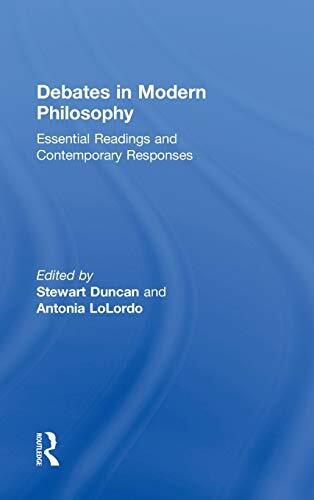 Description: Debates in Modern Philosophy: Essential Readings and Contemporary Responses provides an in-depth, engaging introduction to important issues in modern philosophy. It presents 13 key interpretive debates to students, and ranges in coverage from Descartes' Meditations to Kant's Critique of Pure Reason. Debates include: â€¢ Did Descartes have a developed and consistent view about how the mind interacts with the body? â€¢ Was Leibniz an idealist, or did he believe in corporeal substances? â€¢ What is Locke's theory of personal identity? â€¢ Could there be a Berkeleian metaphysics without God? â€¢ Did Hume believe in causal powers? â€¢ What is Kant's transcendental idealism? Each of the thirteen debates consists of a well known article or book chapter from a living philosopher, followed by a new response from a different scholar, specially commissioned for this volume. Every debate is prefaced by an introduction written for those coming upon the debates for the first time and followed by an annotated list for further reading. The volume starts with an introduction that explains the importance and relevance of the modern period and its key debates to philosophy and ends with a glossary that covers terms from both the modern period and the study of the history of philosophy in general. Debates in Modern Philosophy will help students evaluate different interpretations of key texts from modern philosophy, and provide a model for constructing their own positions in these debates. No comments for "[PDF] Debates in Modern Philosophy: Essential Readings and Contemporary Responses (Key Debates in the History of Philosophy)".